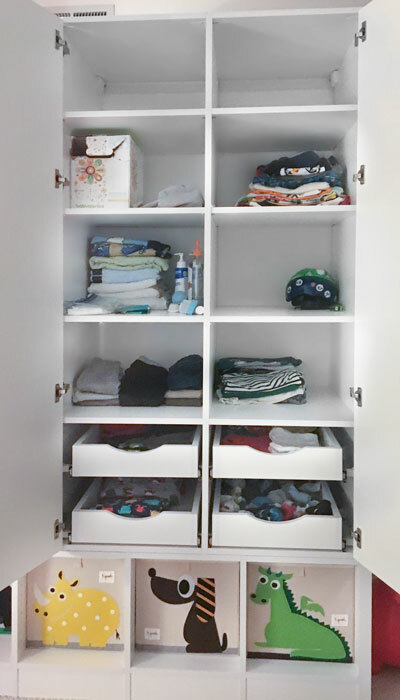 Closet Works designed these storage cabinets to last all the way from childhood into adulthood. The system contains hanging space and drawers adequate to hold the wardrobe of a small child, along with shelves and lower cubbies for toys. Later in life, this multi functional wardrobe closet/wall unit could make a perfect media entertainment center or wall unit for another area of the home. 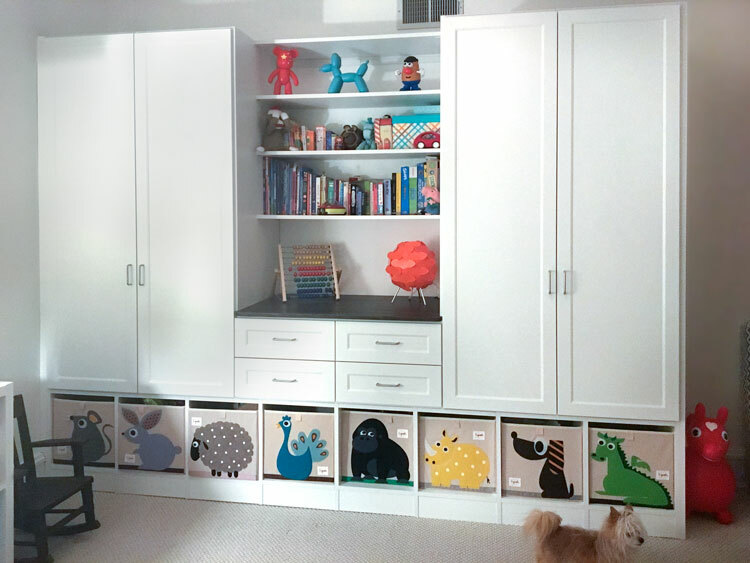 This client envisioned a multipurpose wardrobe closet system for her son's bedroom to keep all of his toys, games, books, and clothes neat and tidy, while also serving as multi functional storage cabinets to last him into adulthood. Closet Works proposed this versatile wardrobe closet/wall unit with special built-in features that would take care of playtime, storytime, getting dressed, and more. On one side, the unit offers double hang sections separated by an adjustable shelf. 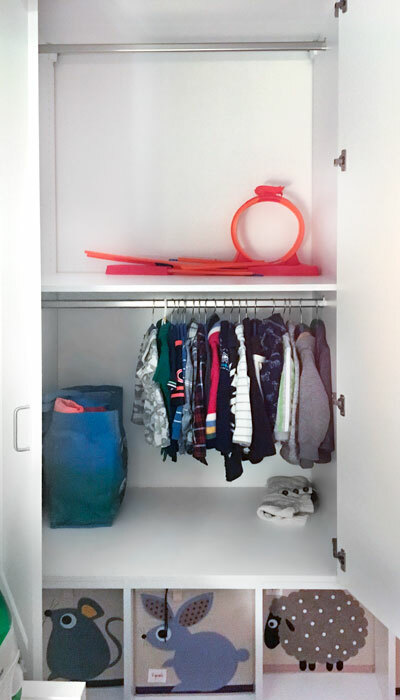 As the child grows, this shelf can be removed and the compartment can be transformed to fit lengthier clothing items. The opposite side provides shelving space and four scalloped pull-outs — eliminating the need for interior hardware on the drawer faces. The center component offers shelves for books and toys, additional drawer space, and a contrasting closet hutch countertop with room for a nightlight or television. The unit spans the wall, reaching an appropriate height for the vent to stay accessible. The lower compartments were mindfully designed for the client's own custom animal drawers to be placed inside. 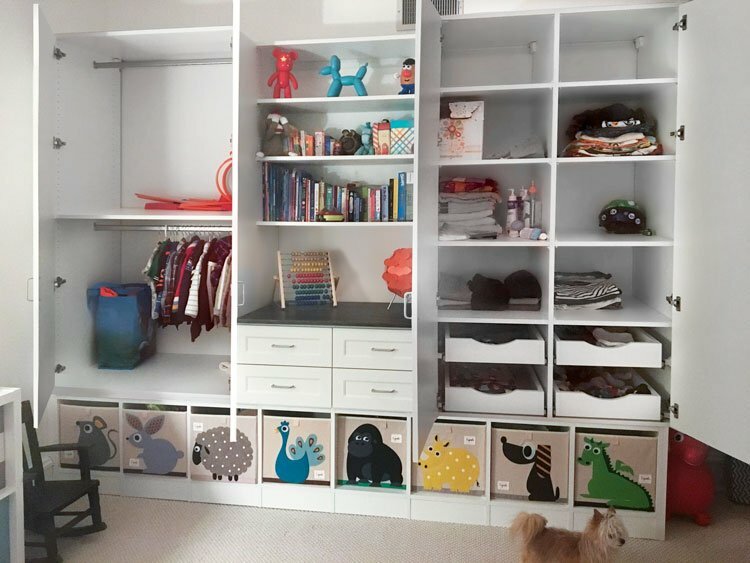 When the child is older, these cubbies might be used to store vintage vinyl records or other media. This client was so thrilled with her son's new addition that she had decorated it right away after installation!